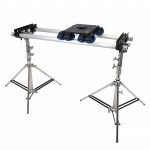 The Dana Dolly is an affordable camera dolly system that can go with you virtually anywhere. 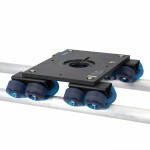 Designed by a key group with over 20 years of experience in all types of production, it is both simple and practical. The Dana Dolly is easy to set up, it can be used with a variety of track options, and can be supported using standard junior stands, apple boxes, or the ground, whatever the shot requires. The dolly itself has a Mitchell Mount that can take all types of camera heads, and this particular kit includes adapters for 75mm. 100mm and 150mm heads. The sixteen-wheel design with floating trucks provides a smooth glide. The track end brackets and center support can use any 1 1/4″ pipe as a track: aluminum, stainless steel, etc.